Organizations compete on the basis of talent. As such, the quality of your hiring decisions has a clear and direct impact on your organization’s ability to compete. It’s not enough just to ‘check the box’. Employers are being held to exceedingly high standards when it comes to ensuring the safety of co-workers, customers, and the public at large. Safety begins with the people you hire. Regulatory attention around employer hiring practices is growing. Anti-discrimination, data protection, appropriate use of criminal records and credit reports, among other issues must be addressed. 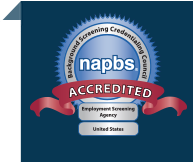 The practices of your background screening provider must be sound. It is these realities, and many others, that make hiring the right people — and having the right processes in place to do so –so vitally important. Your employment screening provider plays a number of essential roles in enabling your organization to compete successfully, mitigate risks, maintain compliance, and build a safer work environment. Your selection should consider criteria around the provider’s background, quality, services offered, customer support, technology, data practices, compliance support, and pricing. 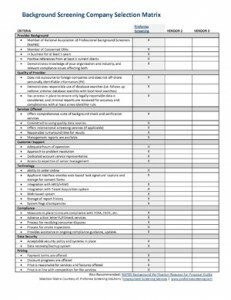 Our free background screening company selection matrix offers you a detailed checklist of 35 criteria you can use to conduct a side-by-side comparison of Proforma Screening Solutions and two or more other vendors.